With the Mid-Autumn Festival just around the corner, many restaurants and hotels have already started selling their mooncakes with my new creative flavours as well as the traditional bakes. 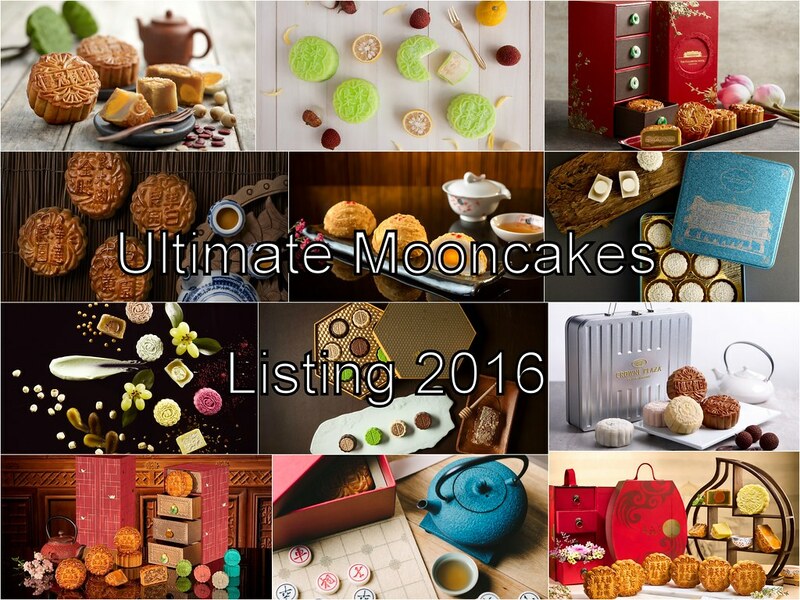 If you are planning to get some mooncakes, be in for self consumption or gifts for friends and/or business partners, here is a list of mooncakes that you may wish to consider. The Fullerton Hotel Singapore celebrates the Mid-Autumn Festival with a line-up of classic and innovative mooncake treasures. 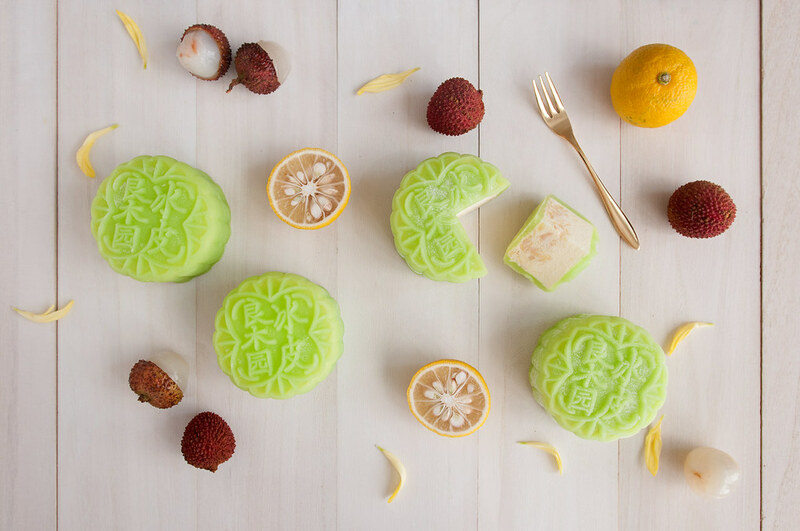 Signature flavours such as Pandan with Gula Melaka Snow Skin Mooncake and The Fullerton Golden Custard Mini Mooncake make a return, complemented by new flavours. Taking centre stage and adding to the snowskin medley this year are two new low-sugar snow skin flavours - Tangerine Lemon with Matcha Red Bean Paste Snow Skin Mooncake and Orange and Chocolate Paste Snow Skin Mooncake and Inspired by Tau Sar Piah, there is the newly introduced Salted Green Bean with Pandan Paste Baked Mooncake. Complementing the new variety is a range of classics such as Baked Mooncake with White Lotus Seed Paste and Baked Mooncake with White Lotus Seed Paste and Single / Double Yolks. The Fullerton Golden Custard Mini Mooncake is also back by popular demand. 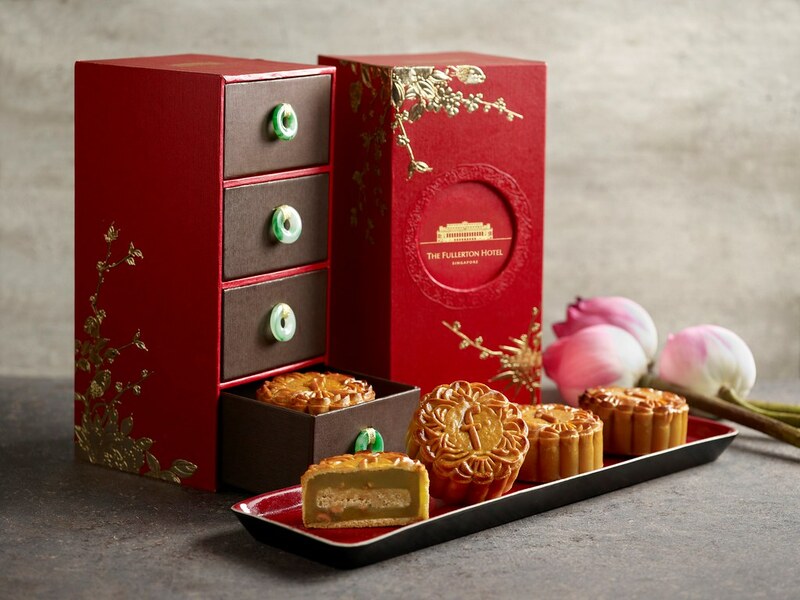 Appropriate for gift is The Fullerton 15 Treasures Premium Gift Set, symbolising the full moon on the 15th day of the eighth lunar month is a single baked mooncake with eight egg yolks encased in a white lotus seed paste. 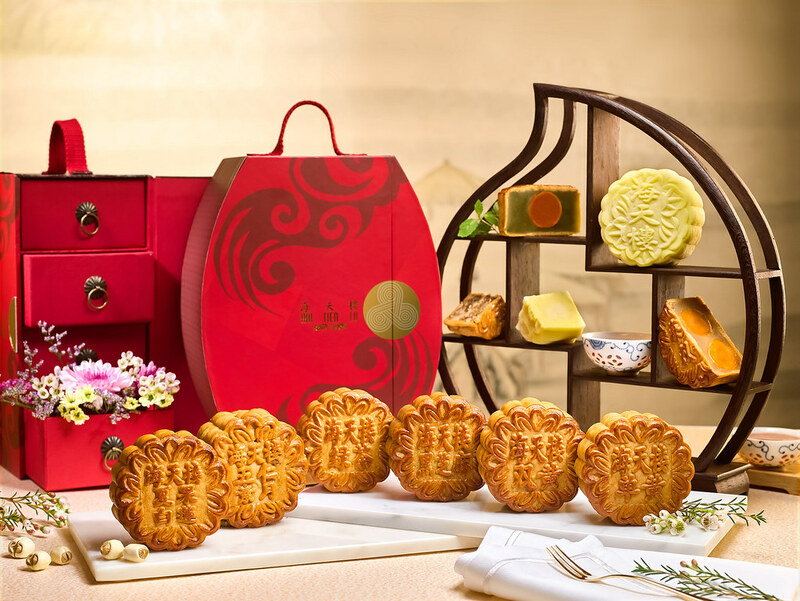 Encircling it are 14 assorted baked mooncake flavours in alternating shapes of a celestial hare, cloud and graceful butterfly; which signify vivacity, prosperity and bliss. Shang Palace heralds the Mid-Autumn Festival with a luxurious Honey Chocolate Collection. The Honey Chocolate Collection features four flavours, Dark Chocolate, Milk Chocolate and Salted Toffee, White Chocolate Passion Fruit with Mango, and Roasted Sicilian Pistachio. 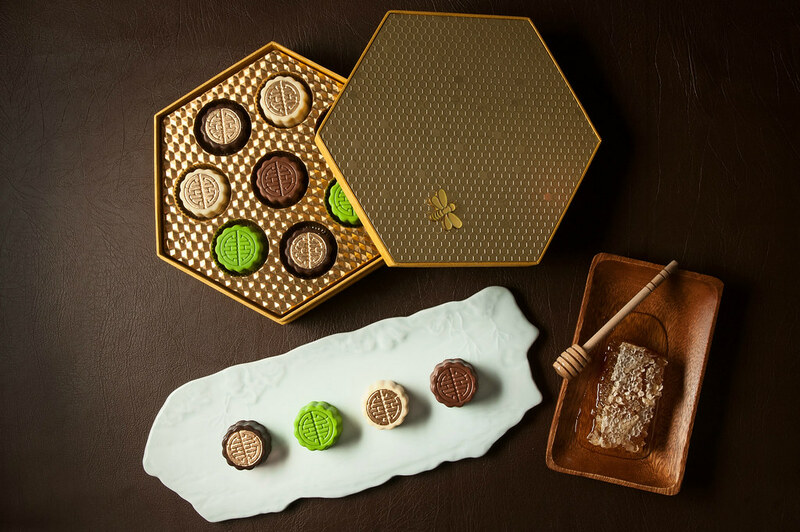 These mooncakes incorporate raw and unprocessed Leatherwood Honey which originates from the pristine rainforests of the Tarkine region in Tasmania where the world’s cleanest air and water are found. Experience a joyous reunion this Mid-Autumn Festival at Hai Tien Lo (海天楼), award-winning Cantonese restaurant at Pan Pacific Singapore, as Executive Chef Lai Tong Ping (黎东平) presents a selection of seven delicately handcrafted mooncakes. New this year are the Green Tea Paste with Single Yolk and Black Sesame with Single Yolk. Durian lovers will continue to be pampered with Hai Tien Lo’s signature Mao Shan Wang Durian Snowskin Mooncake. Those who have a penchant for classic treats may indulge in the Traditional White Lotus Seed Paste with Single or Double Yolk, and White Lotus Seed Paste with Macadamia Nuts. For a healthier alternative and nutty texture, the Vegetarian Mixed Nuts makes a perfect treat this Mid-Autumn season. 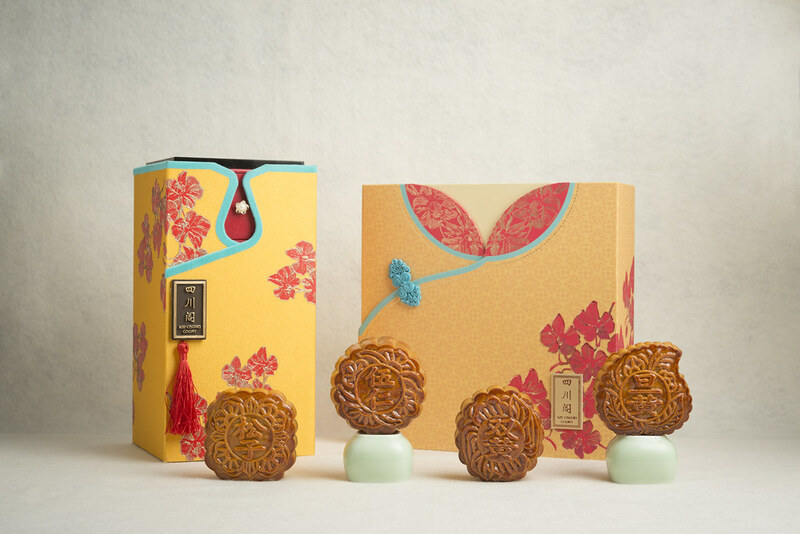 Ideal as gifts for business associates, friends and loved ones is the box of Traditional Four Treasures Mooncakes, presented in an elegantly designed packaging. 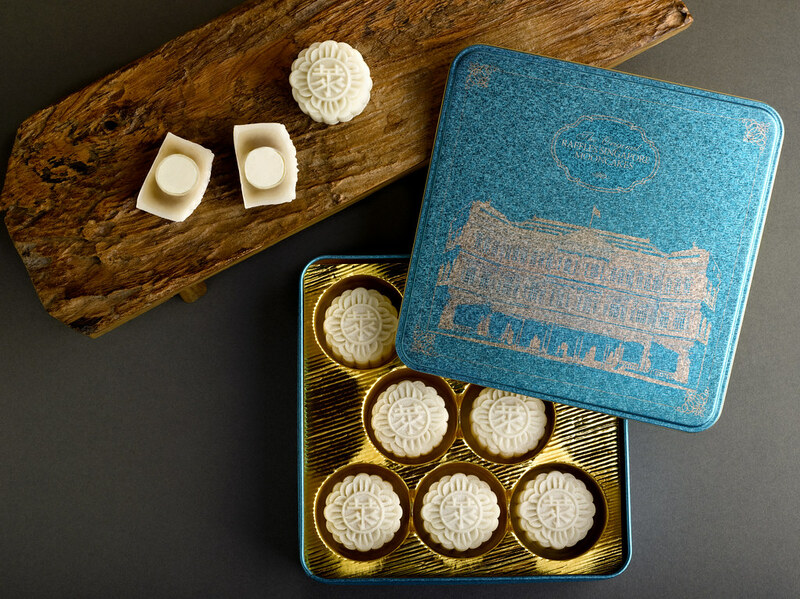 This year’s Raffles Mooncakes are presented in a lovely blissful blue box, adorned with delicate lotus floral. The snow-skin selection considers of perennial favourite Champagne Truffle & Ganache Snow-skin Mooncake. Making a return are the Earl Grey Tea and Chocolate Pearl Truffle Snow-skin Mooncake, Dark Chocolate Crunchy Pearl Snow-skin Mooncake and Raffles Cognac Truffle Snow-skin Mooncake. This year Raffles Hotel has introduced a new handcrafted snow-skin creation, Peanut Butter Milk Chocolate Feuilletine Snow-skin Mooncake. For those who prefer classic traditions, Raffles Mooncakes continue to offer a selection of baked mooncakes to complement celebrations with loved ones, which include Double Yolk with Macadamia Nuts and White Lotus Paste Baked Mooncake, Mother-of-Pearl with Single Yolk and White Lotus Paste Baked Mooncake and Pine Nuts, Macadamia Nuts and White Lotus Paste Baked Mooncake. 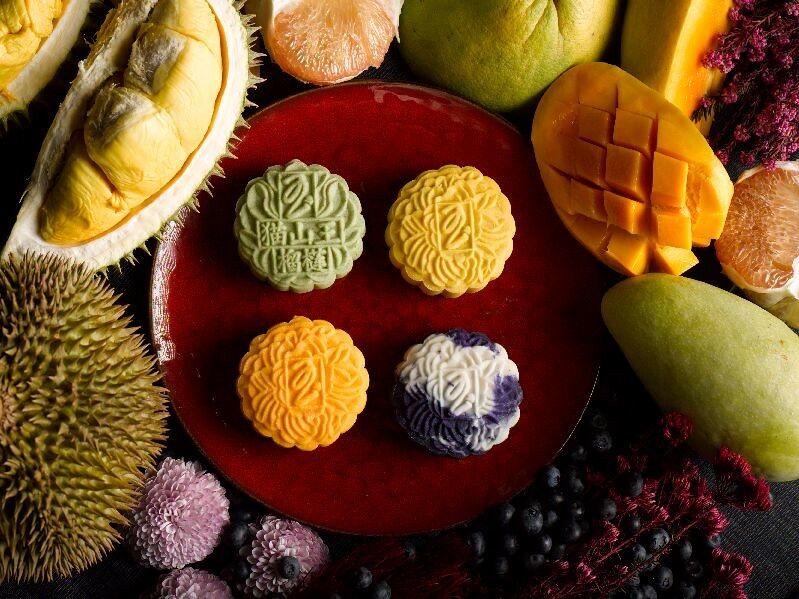 This Mid-Autumn Festival, Summer Palace Dim Sum Chef Leong Kwok Sing introduces a stellar line-up of mooncakes, including two new snowskin mooncake flavours inspired by home-grown desserts: Chendol with White Chocolate and Momordica Fruit with Longan. Not to be missed as well are our signature snowskin selections –Black Sesame Paste with Melon Seeds, refreshing Granny Smith with Lemongrass Chocolate, fragrant Green Tea with Melon Seeds, the classic White Lotus Paste with Yolk and Melon Seeds and our bestseller, Durian. Not to forget their well-loved baked classics such as the Parma Ham and Pork Floss with Assorted Nuts. Other baked highlights include White Lotus Paste with Double Yolk and Melon Seeds, White Lotus Paste with Single Yolk and Melon Seeds and White Lotus Paste with Melon Seeds. 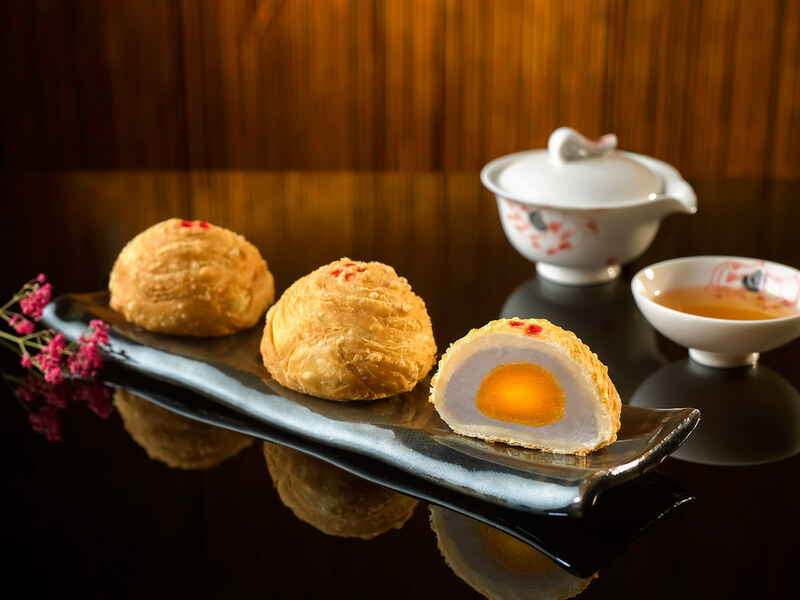 For those looking to indulge, Chef’s Bird’s Nest with Custard promises to please with its decadent custard centre and slivers of premium bird’s nest. This year, celebrate the joys of perfect pairings as Goodwood Park Hotel launches three new snowskin flavours that are each a perfect blend of two complementary ingredients. For the first time in the hotel’s history, it has also introduced alcoholic and chocolate versions for a jazzed-up Mid-Autumn Festival. The talented pastry team is proud to unveil these new creations: Yuzu Lychee Snowskin Mooncake, Dark Chocolate Crunchy Hazelnut Snowskin Mooncake and Gin Pineapple Snowskin Mooncake. Handcrafted and baked to perfection, six quintessential varieties of delicious baked mooncakes are also available – Lotus Seed Paste with Melon Seeds; Lotus Seed Paste with Double Yolk; Lotus Seed Paste with Four Yolks; Assorted Nuts with Ham (‘Kum Toy’); and White Lotus Seed Paste with Single or Double Yolk. Ideal as gifts or for one’s own Mid-Autumn celebrations, the Baked Combo consisting one piece each of Lotus Seed Paste with Melon Seeds, Lotus Seed Paste with Double Yolk, White Lotus Seed Paste with Single Yolk and Assorted Nuts with Ham mooncakes is a definite crowd-pleaser. 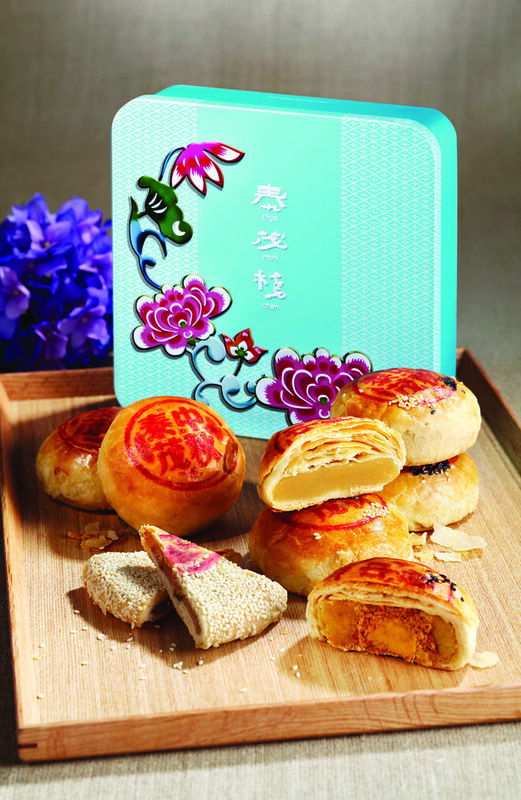 Old Seng Choong launches its first Mid-Autumn range with the largest selection of baked mooncakes. Old Seng Choong will be presenting SEVEN baked mooncakes four of which are filled with premium white lotus paste and a variety of nuts and salted egg yolks. Customers can also relish the unique Red Bean Orange Peel with Yolk Blend & Pine Nuts Mooncake and Custard Egg Yolk Blend Mooncake. Traditionalists can take delight in a perfectly executed Wu Ren Mooncake and for those who simply must have the quintessential Singapore-inspired durian snowskin, Old Seng Choong will also have the Mao Shan Wang Durian version in its line-up. The mooncakes are packaged in handsome boxes with vibrant hues of midnight blue and fuchsia pink. Each elegant box evokes a sense of nostalgia and celebration. The pink peony design celebrates the Autumn Revelry one expects during this delightful festival and the gorgeous chrysanthemum motif conjures up visions of the full moon in its Midnight Rhapsody. 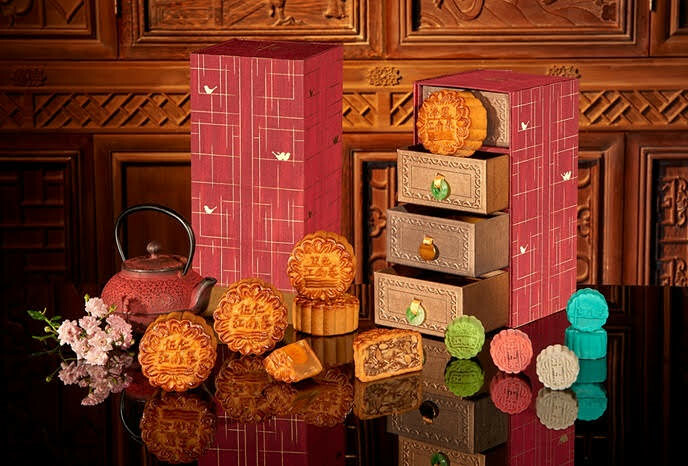 These elegant boxes are perfect gifts during the Mid-Autumn Festival. Hilton Singapore introduces four new snowskin mooncake flavors, each is carefully handcrafted using premium quality flour for the melt-in-your-mouth texture. They are Signature American Cheesecake, Popping Candy, Muscat White Grape and Baileys. For the traditional mooncake devotees, pick from a selection of six baked-to-perfection mooncakes that are best enjoyed with a cup of Chinese tea. 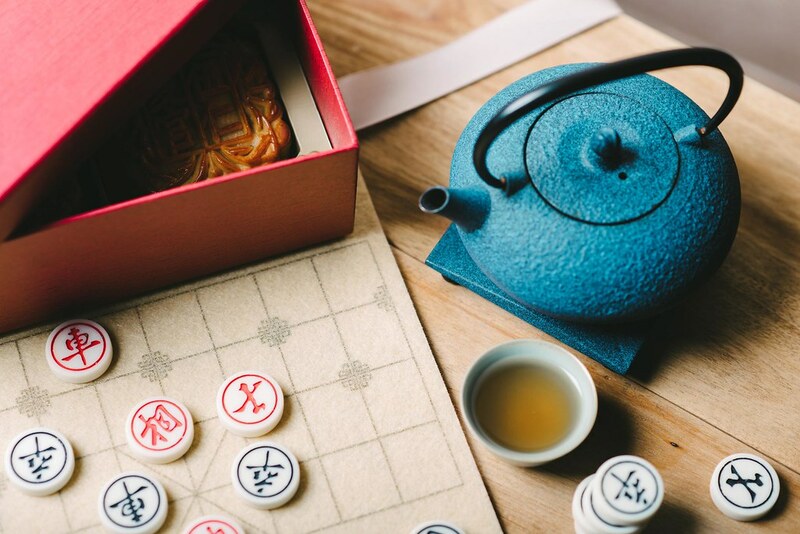 Besides the classic plain white lotus, white lotus with yolks and the traditional mixed nuts mooncakes, look out for fusion creations of green tea walnut; a less sweet option packed with green tea flavor and crunchy walnuts, or the cranberry white lotus mooncake. In celebration of the upcoming Mid-Autumn Festival, Si Chuan Dou Hua Restaurant is proud to unveil a classic collection of mooncakes perfect for gifting to loved ones and business associates during the festive season. The collection is available for purchase at all three restaurants and online. Making a comeback due to popular demand is the Baked Filo Pastry Yam Paste Mooncake with Single Yolk. Fans of sweet maple syrup will be pleased to know that the Traditional Maple Walnut Mooncake will debut for the first time at Si Chuan Dou Hua Restaurant this year. Also available are the traditional White Lotus Seed Paste Mooncakes with Single and Double Yolks. Si Chuan Dou Hua Restaurant’s mooncakes. 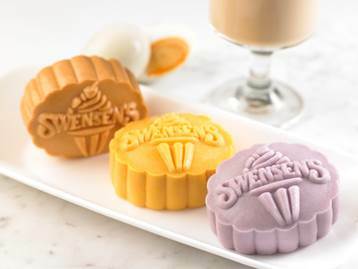 Enter into the magical world of Swensen’s Moon Treasures mooncakes in six irresistible ice cream flavors. The family restaurant introduces three exciting flavors – Salty Eggy, Coco Yammy and Aroi Milk Tea, bound to cool your taste buds and keep you satisfied after a hearty meal. Fans of their quintessential mooncake range can treat themselves to familiar, all-time-favorites like the Durian Royale and Sticky Chewy Chocolate. 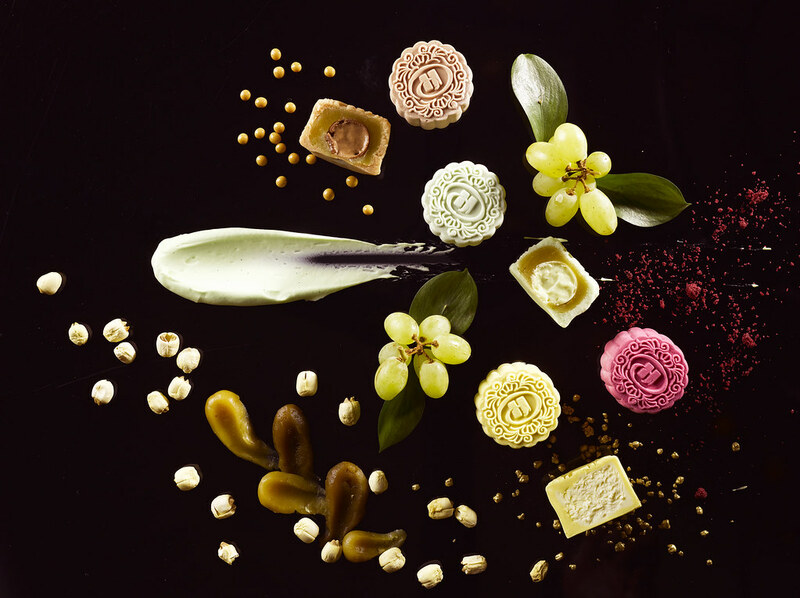 Renowned as Szechuan Court’s resident mooncake maven, dim sum Chef Mandy Yeo collaborates with Fairmont Singapore’s Executive Pastry Chef Sebastian Cocquery-Beraud for a second year running to create a duo of new luscious snowskin flavours. Two new flavours Imperial Yuzu and Cranberry Snow are taking centre stage this year. A resounding hit with the crowd last year, two liquor-imbued snowskin flavours return with their winning combo of high-grade chocolate and booze, Rum & Raisin Chocolate Truffle and extravagant Champagne Truffle & Chocolate Ganache. 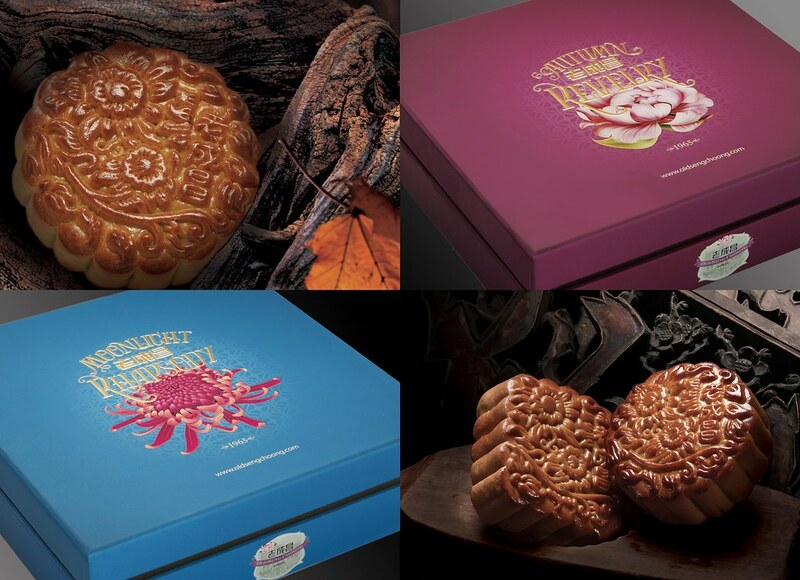 Fans of traditionally baked mooncakes are treated by an entourage of four much-cherished varieties. Carefully baked to a golden brown perfection, signatures include Peach-shaped Mooncake with Single Yolk & Macadamia Nuts in White Lotus Paste and Autumn Treasures. This year, Crowne Plaza® Changi Airport introduces traditional baked mooncakes in three variations; White Lotus Paste with Double Egg Yolk, White Lotus Paste with Single Egg Yolk and White Lotus Paste with Melon Seeds. New snow skin mooncake selections include Lychee bits and Lima Beans with White Lotus Paste, Salted Caramel with Dark Chocolate and Crunchy Dark Chocolate. 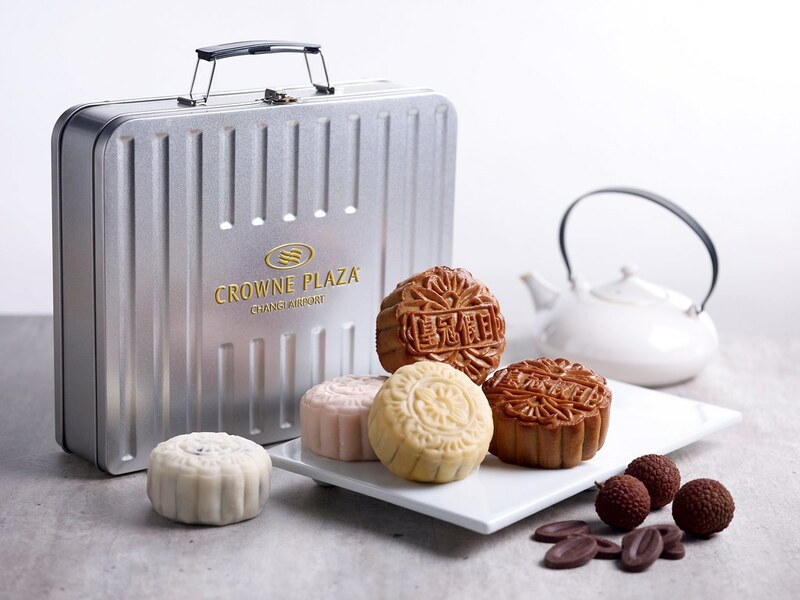 The mooncakes from a halal-certified source are presented in a sleek and compact metal suitcase, which makes an ideal gift idea for business associates and loved ones. Four Seasons Hotel Singapore presents a beautifully curated menu of traditional favourites and limited edition creations by its award-winning Chinese restaurant Jiang-Nan Chun. The chefs-d'oeuvre of this year’s selection include the limited edition “Heaven on Earth” snow skin mooncake, a show-stopping creation. Reminiscent of the beauty of Jiang Nan, it is an exquisite gem in Jiang-Nan Chun’s signature cerulean blue with dainty bird motifs, and infused with the restaurant’s exclusive “Heaven on Earth” cocktail in a light 1% alcohol content. The “Smoked Duck with Assorted Nuts and Lime” baked skin mooncake is another mouth-watering creation. Jiang-Nan Chun is one of the rare places in Singapore where duck is roasted in a wood-fired oven, and the tantalizingly savoury blend of aromatic smoked duck enhanced by crunchy nuts and a zest of lime is a feast for the senses. In addition to the limited edition signature “Smoked Duck with Assorted Nuts and Lime” baked skin mooncake, well-loved classics “Silver Lotus Paste with Double Yolks and Melon Seeds” and “Silver Lotus Paste with Single Yolk and Melon Seeds” mooncakes and the non-yolk “Silver Lotus Paste with Honey and Pine Nuts” mooncake are best-selling favourites each year. Neo Garden Catering brings you an assortment of traditional mooncake flavours. The Neo Four Treasures is made up of the following flavours: Assorted Fruits & Nuts; Double Yolk White Lotus Seed; Fragrant Black Sesame; and Single Yolk Emerald Lotus Seed. Filled with generous portions of fruits and nuts, the classic Assorted Fruits & Nuts is an all-time bestseller. For a guilt-free indulgence packed with wholesome nutritional goodness of vitamin B, the new Red Bean flavour might just be what you are looking for. 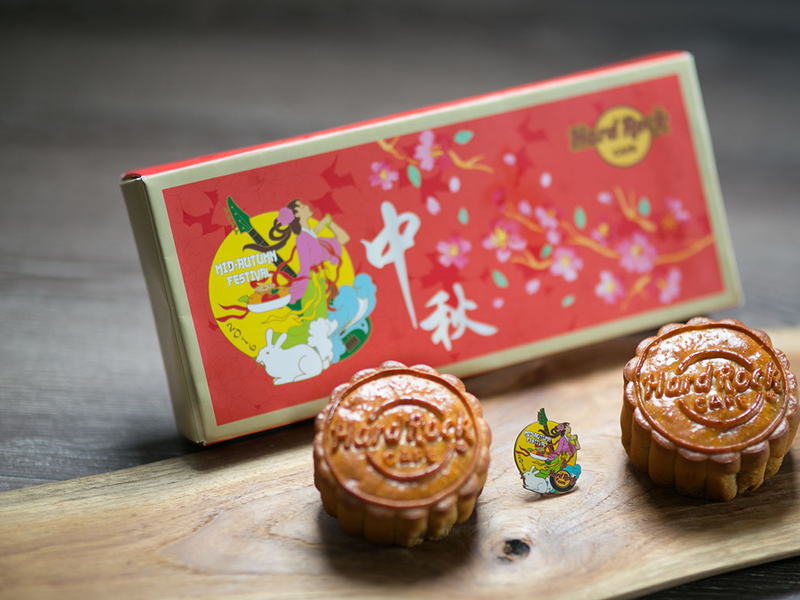 Hard Rock will launch its first-ever mooncake gift set in celebration of the Mid-Autumn festival. The gift sets will be available in two classic mooncake flavours: Baked White Lotus with Macadamia Nuts and Baked Double Yolks White Lotus. Each set also comes with a limited- edition Hard Rock pin, inspired by the beautiful story of Chang Er. 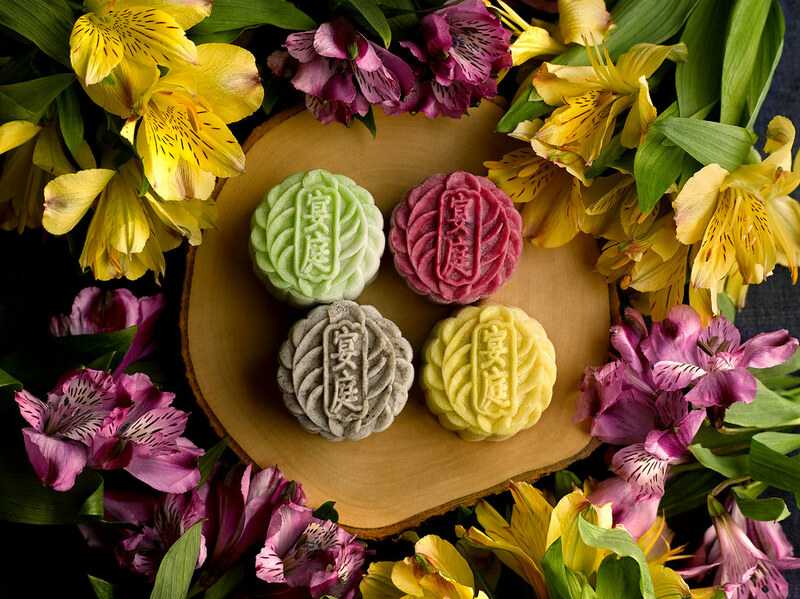 Peony Jade offers six new mooncake flavours from modern spins on popular Chinese classics along with its Aaward-winning timeless signatures this Mid-Autumn Festival. The New baked creations include Baked Mooncake in White Lotus Paste, Turmeric Skin with Ginger and Lemon Grass, Baked Mini Mooncake with Molten Matcha and Salted Yolk, Mini Snowskin with Rose Lychee and Raspberry Jelly Centre, Mini Snowskin with Dark Valrhona Chocolate, Sea Salt, Peanut Butter, Banana Bits and Feuilletine, Wild Blueberries Yoghurt Snowskin and Snowskin with Salted Dark Valrohona Chocolate, Feuilletine and Milk Rocher. Thye Moh Chan, an iconic local Teochew confectionary brand with a 70-year old heritage is proud to present their much-anticipated traditional Teochew mooncakes this Mid-Autumn Festival. Savour the familiar taste of its flaky-skinned mooncakes such as the Sweet or Salty Tau Sar, or enduring Teochew classics such as the Double Delight filled with red bean and winter melon paste. Exclusively available during the Mid-Autumn Festival are new relished favourites such as the Mao Shan Wang Durian and Teochew Yam with Salted Egg flavours, with limited quantities produced daily and only available for purchasing at the stores. This Mid-Autumn Festival, indulge in Yan Ting's delightful variety of masterfully-handcrafted snow skin mooncake creations and traditional baked mooncake assortment. Featuring four new flavours - Pomegranate Truffle with Red Bean Chendol Paste Snow Skin Mooncake, Salted Peanut Truffle with Black Sesame Paste Snow Skin Mooncake, Purple Sweet Potato with Water Chestnut and Salted Yam Paste Snow Skin Mooncake and Portugese Custard Paste Snow Skin Mooncake. With the all time favourite Pure Mao Shan Wang Durian Indulgence Snow Skin Mooncake making a return. For those that prefer the traditional baked mooncakes. There are the Baked Mooncake with White Lotus Paste and Single/Double Yolks, White Lotus Paste with Assorted Nuts and Yunnan Ham Baked Mooncake, Reduced Sugar White Lotus Paste with Macadamia Nuts Baked Mooncake and Reduced Sugar White Lotus with Four Yolks.